The ability to summarize is an incredibly important academic skill. Whether it’s writing a summary or simply incorporating a very short one into an analysis, students are constantly required to use summary skills. Hence, it is very important to be strong on them early. But summarizing is often not taught well, leaving many people confused and uncertain. How can you develop strong summary skills and learn the structure of a summary? With these fun activities, you’ll find it both easy and enjoyable. 3-2-1: This strategy involves a chart listing three things learned today, two interesting things, and one remaining question. The chart allows the summarizer to come up with specific questions to answer. It is a quick, easy activity that is good for starting out a new person on the road to a good summary. Inside-Outside Circle: Best done in a group, this activity involves forming two circles. Each person in the circle summarizes the source to the other person. Then after a pre-set amount of time, each circle revolves, bringing each participant to a new partner. Jigsaw: This technique makes each student a teacher. Students are divided into small groups and each student is responsible for a small piece of the information given. In each group, the students all explain their part in detail. The collaborative effort teaches them more summarizing techniques and helps them feel in control of a small part before they move onto a large text. One-Word Summaries: This is a powerful technique where students are required to summarize a text in one word. It teaches critical thinking skills and summarizing vs paraphrasing, as each student has to consider very carefully and then defend their word choice. Furthermore, it teaches them to be concise, which is one of the most difficult aspects of learning to summarize. Think-Pair-Share: A classic for many activities, think-pair-share is a three-stage process that allows students time to develop and refine their thoughts. First, students are given quiet time to reflect and jot down their thoughts. Then they are paired with one or more other students and discuss their ideas. Finally, they present their refined ideas with the class. Summary Ball: The Summary Ball is a fun, active technique that allows students to move a little as well as learn. Students stand in a circle and a beach ball is thrown around. Each student must contribute a new fact from the lesson, and each student must get the ball at least once. Somebody-Wanted-But-So: This technique consists of a chart which helps students learn about conflict and resolution. The chart has four blanks telling who initiated the event, what they wanted, what the conflict was, and what happened after. GIST: The GIST strategy involves a chart asking who, what, when, where, and why, and then requiring students to summarize the text in twenty words. This allows students to learn to be concise while still being complete. Summary Star: The Summary Star is a simple template with five corners that allows students to practice their summarization techniques. The students rename the story in one word, discuss how it made them feel, and answer setting, problem, and solution. This helps them grasp a complete view of the story. Graphic Organizers: Graphic organizers can be incredibly helpful for students who learn visually. Consider a chain of events chart, a problem-solution chart, or a story pyramid. Students fill these out and understand the story as a visual construction, not just as an abstract event. Learning how to summarize is never an easy task, but fortunately, these strategies can help make it more fun. Whether you’re using them for yourself or your students, we hope that you have learned something new from this list. These are only a few of the potential activities, so don’t limit yourself. Mix them up, find new things, and keep being creative. You’ll enjoy yourself much more that way! Identify the thesis or purpose of the text being summarized. The main ideas that support the thesis statement must also be identified. Express both the thesis and supporting ideas identified, using your own words. Your words should convey the original authors meaning so that it is clearly understood, and provides an overview of the main ideas without losing focus and becoming too general. For an effective result, you must follow a good distilling practice. Summarizing text includes making decisions about what concepts should be included in the summary deposition, and which concepts can be left out. If you are unsure how to write an effective summary, we offer a service that can help. 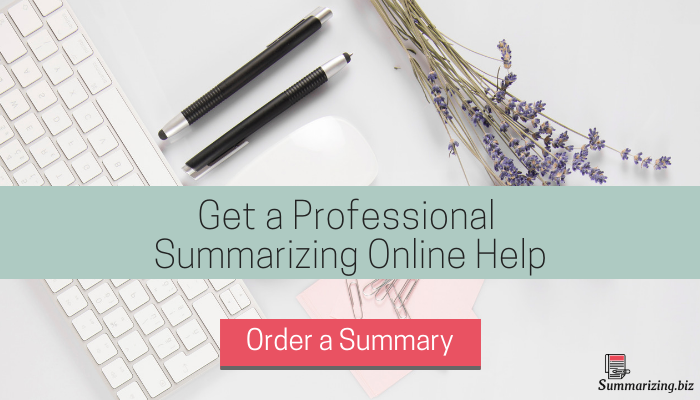 For more amazing summarization techniques, contact us now and find out how to excel!